Watercolor on paper, 39.5 x 30.5 cm (15.5 by 12 in). Signed and dated "(18)77“. Fine original frame black coated and decorated with a border of vine leafes gold-plated. Dimensions framed: 72, 5 x 61.5 cm (28.5 by 24.2 in). Friedrich Perlberg was the son of the artist Johann Christian Perlberg. He studied architecture and landscape painting at the Nuremberg arts and crafts school and in Paris from 1868 until 1875 and is particularly well noted as a fine watercolour artist. His watercolors are in numerous public collections, including Neue Pinakothek Munich, Städtisches Museum Munich and Kunsthalle Bremen. Literature: Thieme-Becker, vol XXVI, p. 419; Friedrich von Boetticher (Listed works from artists of the 19th Century), vol II/1, p. 237. Further reading: Bruckmanns Lexikon der Münchner Maler im 19. Jahrhundert (Artists in Munich at the 19th Century), vol 3, p. 266/67, see works by the artist Friedrich Perlberg at fig 74 and 76, "Giesinger Old Church" Watercolor, 1886 (Collection of Stadtmuseums Munich). At the time of Industrialization in the second half of the 19th Century, the wealthy society from larger towns discovered the rural idyll for their holiday trips, so as the early tourism began. Here, in conversation with local mountain guides in a romantical small mountain village sightseeing a most atmospherical Alpine landscape. 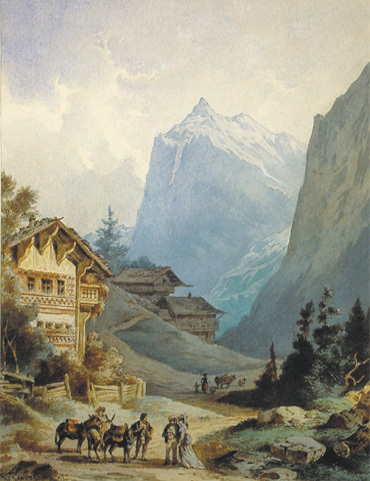 A excellent and beautiful watercolor work of the 19th Century by the well known Munich artist. Fine original condition.